the best features from the LONG FIN / SKEG combination & add a SAFETY FACTOR. NEW YORK / VOYAGER 655 Transits the North West Passage. See STUDY PLANS for photos etc. 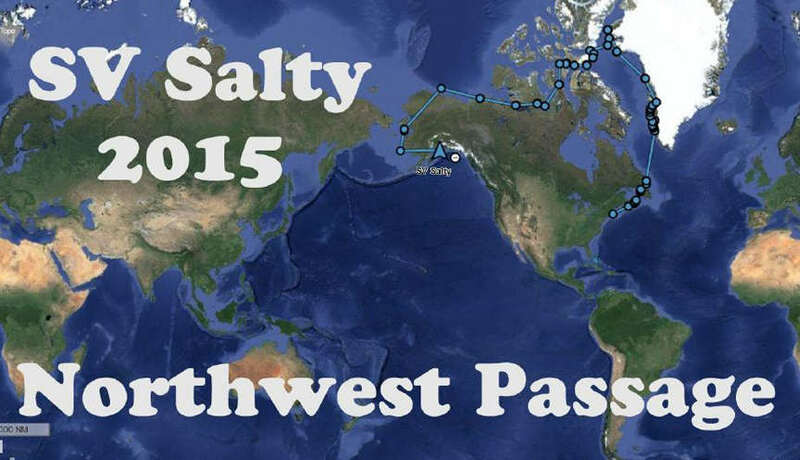 Now, after almost three hard months of nearly continuous travel, we're roughly two-thirds of the way along the Northwest Passage, and we've put literally thousands of miles behind us. And as far as our 64-foot yacht, Ocean Watch, is concerned, I can't imagine a better tool for the job at hand. She always had pretty lines, and that's a good sign. 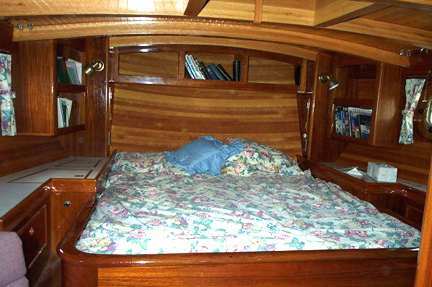 The previous owners, a husband-and-wife team of marine biologists who'd used the boat partly as a floating laboratory and also as their liveaboard home, had looked after her well. But her systems, wiring, plumbing, rig, and sails were old and tired. For the trip we had in mind, she'd need a total overhaul. 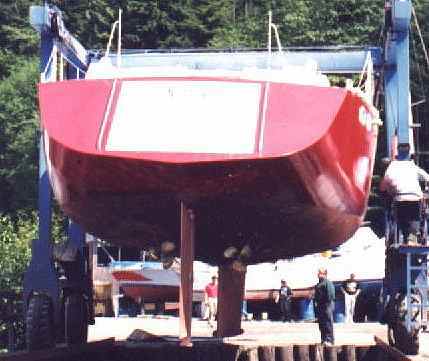 Last fall and winter, under the direction of our first mate, Dave Logan, Ocean Watch was completely transformed in a Seattle boatyard. Dave and I will be writing in depth about her refit in an upcoming print edition of Cruising World. For the time being, let me just say that when I drove out West last May to begin the voyage, I knew she'd undergone a ton of work. But I still couldn't believe my eyes. The last time I'd seen the old girl, as the saying goes, she'd been ridden hard and put away wet. Now she looked like she was ready for anything, and since we were bound for the Arctic Circle, that was a very good thing indeed. 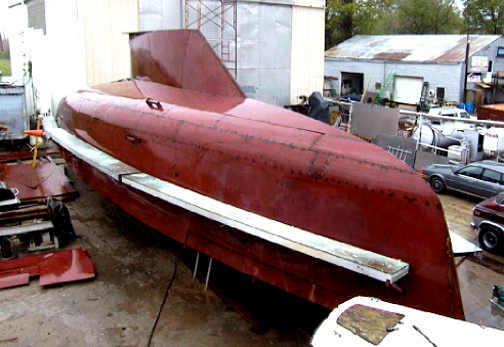 NEW YORK 65 - boat plans - Fiberglass, steel or aluminum. NOTE: Wood / Epoxy boat plans & patterns also available for this design. 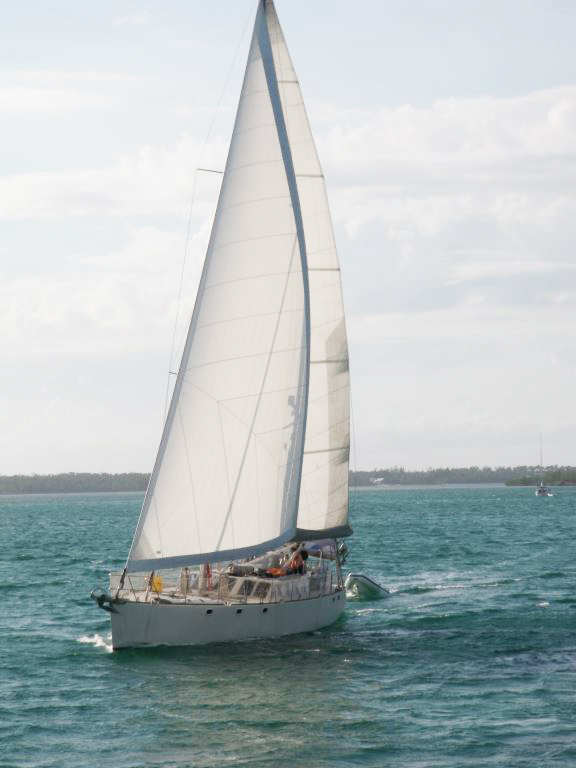 This is a sailboat that can be modified to suit a variety of sailing lifestyles. 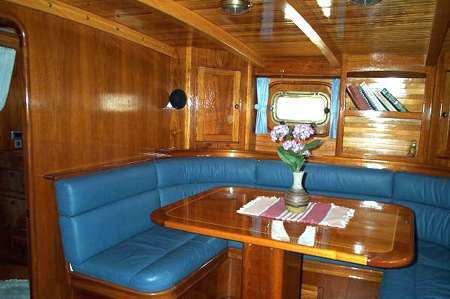 Both Slimline & regular beam versions are available as boat plans and frame patterns to be built in Steel or Fiberglass. The New York 65 is ideal for luxury charter or fast family sailing and offers a variety of accommodation options and many accommodation layouts are possible. Each New York 65 version will vary depending on the building material, draft limitations and any client options and requirements. Construction methods include: Radius chine aluminum, Radius chine steel and any one of the fiberglass methods. There are several different accommodation arrangements available. Andrew Bermel, my USCG delivery captain sent u a link to the Carol Lee. Surfing a Bruce Roberts designed "Carol Lee" ( EX Melon Eye ) down some 12-14 occasional 16+ foot / 5 m seas. Winds were sustained 35 knots gusting higher. 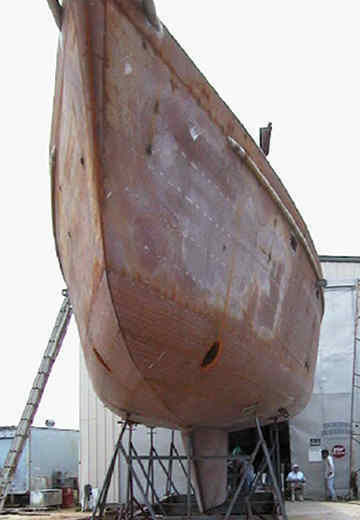 The Carol Lee is a steel 65 foot long cutter rigged sloop. This video was taken shortly after sunrise just south of Cape Mendocino. I’ve attached a few pictures of her sailing, we’ve only owned her about 5 months so haven’t had a chance to get really good pictures. She looks pretty rough and needs a paint job but we are slowly improving her while we cruise. We love her because she was well made and has good bones. Even though she’s 65’ long we find that the both of us can handle her with ease. A great design. Regards Carley. The NY 65 features a low profile and will suit those that like their boats to look long and sleek ! A shorter deeper keel is available ... Cutter, Sloop of ketch sail boat plans can be used on this version. The accommodation plan shown for can be varied to suit the owners personal choice. 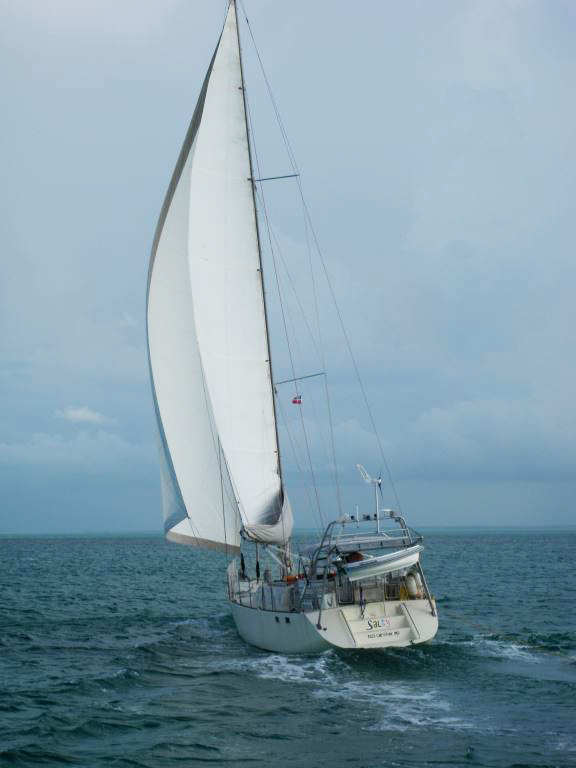 Note the optional longer shoal keel is shown in this profile view. Dear Bruce, I have constructed a beautiful New York 65 "Melon Eye. I would like to share info with you. Paul & Melinda West of Ketchikan Alaska. Hello, I wasn't sure if Paul responded to you letter or not. We have made a lot of progress with the Melon Eye. We put her under Sail last year. The interior is almost done fewer stacks of lumber! Thanks for the interest. She is really a beautiful boat. Paul has done a wonderful job. Paul & Melinda West. 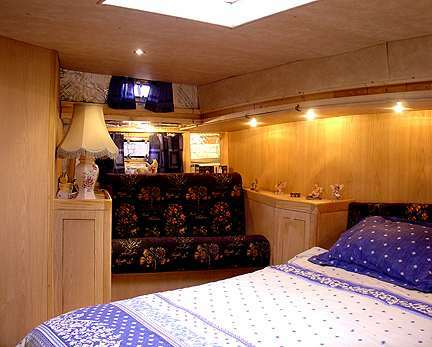 Here we see the large berth as featured in the master cabin ....Photos show a recently launched NY 55 built by Ian and June Thorpe. 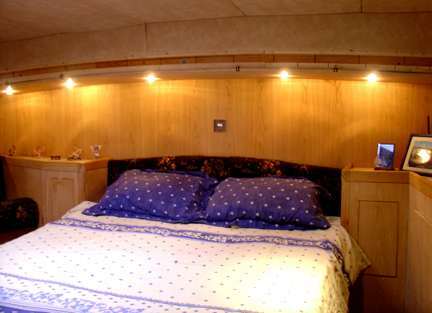 As alternative to the two double staterooms aft ... This arrangement easily fits into the NY 65. Stern view of Melon Eye - unfortunately the transom steps do not show up in this photo.
. . . GIVE ACCESS TO MANY step by step BOAT CONSTRUCTION DRAWINGS AND PHOTOS + PHOTOS OF COMPLETED BOATS ETC. Note the fairness of this radius chine hull. 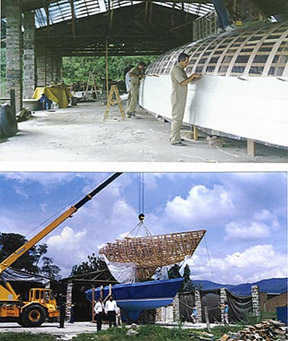 Here we see the construction of the hull male mold which consists of frames cut using the full size patterns supplied with the boat plans plus the addition of timber battens, C-flex fiberglass and shows the first layers of fiberglass laminate.